A long time ago, members of the Aboulou tribe living in the moist and tropical forests of distant Balourdpotamie invented a kind of ritual game to determine who warriors would pocket the best pieces of freshly killed mammoth. Thanks to the abnegation of archaeologists, this game has reached us and it is now possible for you to acquire it, to perpetuate the tradition Aboulou, and share to your advantage the leg of Sunday at step-mom. 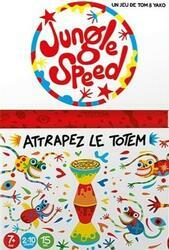 Jungle speed is a hairy game that will allow you to measure your reflexes and liveliness. Each has cards that he will have to get rid of to carry the game while a totem of wood throne in the center of the table. At each turn, cards are returned, if two cards are similar, the players concerned must grasp the totem as quickly as possible, and the fastest player then passes his cards to his unfortunate opponent. To make things worse, there are virtually similar cards that can trick players and others who will force all players to intervene.